Buy only the pure gel from a reputable natural health supplier and use topically as needed. 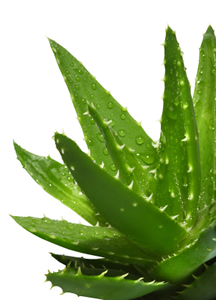 Aloe is moisturizing, anti-inflammatory and helps to prevent infections. Recipe Instructions: :As soon as you suffer a burn, break or cut off an outer leaf of an Aloe plant, split it open with your fingernails, and squeeze the leaf gel onto the burn.